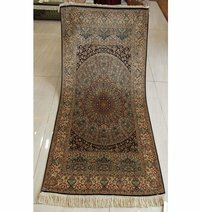 Hand-knotted Carpets from Kashmir are made out of natural mulberry silk; they enjoy a special place of pride in the handicraft industry worldwide. 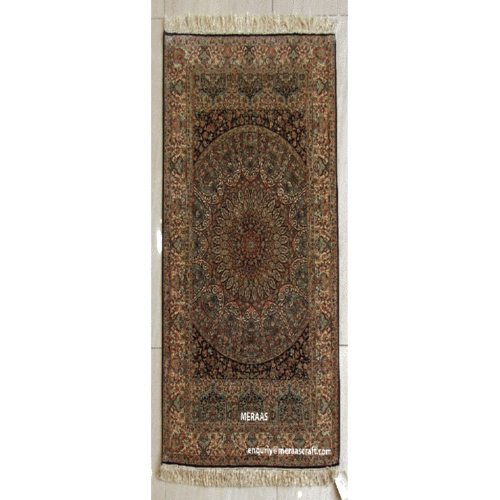 They have intricate designs that are primarily oriental, floral style in a range of colors, sizes and quality. 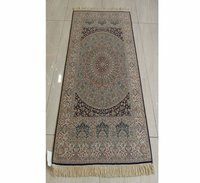 Kashmir rugs are renowned to have bright, jewel-like color tones such as sapphire blue, ruby red, emerald green, aquamarine, amethyst, and ivory. 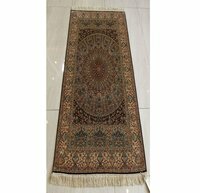 Rugs from Kashmir are traditionally hand woven in oriental, floral designs that typically involve the significance and culturally important motifs such as the paisley, Chinar tree (the oriental plane) and tree-of-life. Most of these designs are rooted in the Kashmiri way of living and are a symbolic representation of the age-old Kashmir tradition of hospitality, warmth and genuine love. In fact, they are artistic expressions of our weavers' skill and imagination. 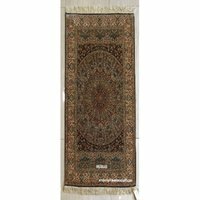 Size in feet: 3 ft. x 5 ft.
Quality: 24*24 / 8.9 Lac Knots per Sq Mt.